↑ अ आ "Informe científico que estudia el Aconcagua: el Coloso de América mide 6.960,8 metros" [Scientific Report on Aconcagua, the Colossus of America measures 6960,8 m] (स्पेनी में). Universidad Nacional de Cuyo. 4 September 2012. मूल से 8 September 2012 को पुरालेखित. अभिगमन तिथि December 3, 2017. ↑ "There is no definitive proof that the ancient Incas actually climbed to the summit of the White Sentinel Aconcagua, but there is considerable evidence that they did climb very high on the mountain. Signs of Inca ascents have been found on summits throughout the Andes, thus far the highest atop Llullaillaco, a 6721m mountain astride the Chilean-Argentine border in the Atacama region. 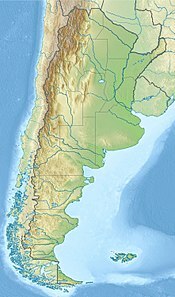 On Aconcagua, the skeleton of a guanaco was found in 1947 along the ridge connecting the North Summit with the South Summit. It seems doubtful that a guanaco would climb that high on the mountain on his own. Furthermore, an Inca mummy has been found at 5400m on the south west ridge of Aconcagua, near Cerro Piramidal" R. J. Secor, Aconcagua: a climbing guide, The Mountaineers, 1994, ISBN 0-89886-406-2, p. 13. ↑ Guías Pedagógicas del Sector Lengua Indígena, Aymara, Ministerio de Educación, Fondo de las Naciones Unidas para la Infancia, UNICEF, Santiago de Chile, 2012 (Spanish), p. 62 Janq’u q’awa (Aconcagua: quebrada blanca).